The G-Pod, designed by architect Dan Sparks, is not your average shipping container home. This transformative building comes fully equipped. The re-purposed container shells are smartly outfitted to fulfill every need for compact living off the grid. This makes them useful in many situations from urban to remote. Of course their ability to ship easily, rapidly, and globally makes them a fast housing solution. 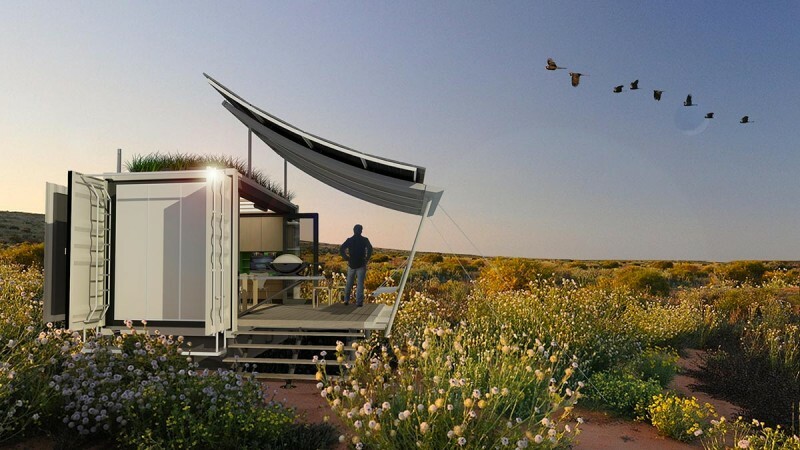 Each G-Pod is independent with solar panels, its own 5000-gallon rainwater capture and storage system, a green roof where you could grow food, and composting toilets. LEDs, magnesium board walls and ceilings, and FSC (Forest Stewardship Council) certified bamboo floors and cabinets continue to minimize the environmental footprint. Yet it expands up to three times the original footprint of the original container shell. When on-site, sections pull out to reveal bedrooms, bathroom, en suites, or additional living space. The front wall folds down to create a deck with an integral canopy. Options are unlimited to accommodate your needs and family size. A village concept can be realized by a number of pods connected via walkways. And the list of included items is surprising. Every item from the built-in cabinets, appliances, plumbing fixtures, lighting, furniture, bedding, window blinds, insect screens, dinnerware, and even a stainless steel BBQ bench are included.